Why is it so important to keep ivy under control? Posted May 28, 2018 by GardenBusters & filed under Garden Maintenance. Ivy can look fantastic climbing up the side of a house but it is also very easy to let it grow wildly out of control. While climbing plants such as ivy are a popular choice to bring character and interest to house and garden walls they do need to be carefully managed. Posted April 28, 2018 by GardenBusters & filed under Garden Maintenance. After the winter lawns can be left looking a little neglected and with the first bursts of sunshine making their presence felt spring is a good time to consider getting your garden ready for summer. Posted March 19, 2018 by GardenBusters & filed under Garden Maintenance. Spring is here and hopefully that means some much-need sun along with a healthy dose of rain to get everyone’s gardens flourishing. The end of winter is the perfect time to get ready for the gardening year ahead – it is also the perfect time to prune trees. Tree pruning is best left until the end of winter when the trees remain dormant ahead of the sap rising as they enter the growth period heralded by the start of spring. Pruning will help trees continue to grow with good strength; it will also encourage denser growth. Additionally, where areas of a tree have become overgrown pruning will allow you to take control of this. With the strong winds and harsh cold of this winter some of your garden trees could have suffered damage. Check all the trees for signs of damage – any that have broken branches will more than likely need to be cut back to allow for re-growth. Spotting signs of decay and disease in trees is important to managing the health of your garden. Pruning a diseased tree may help to stop the spread of the disease and prevent any dead branches becoming a home for pest insects. This is also a great time to tackle branches that could annoy the neighbours by overhanging their property, or that could pose a threat to safety in the event they break off. When to call in the experts? Light pruning to maintain trees is part and parcel of everyday gardening and should be straightforward as long as it is done carefully and in the right conditions. When it comes to bigger trees, however, it is always wise to call in the experts. A trained tree surgeon will be able to judge exactly what work needs to be carried out – and how this can be done in a safe manner, accounting for the weight of the branches and height of the tree. As larger trees are generally more mature, a tree surgeon will be aware of protecting the tree from any unnecessary damage. If you need help pruning a tree contact Gardenbusters. Posted January 18, 2018 by admin & filed under Garden Maintenance. With storms blowing in on a regular basis and frost and ice biting, winter is the time of year when garden fences feel the strain. If you find the fence around your house is starting to creak under the strain – or in the worst case scenario blows over completely – it could be time to look at having it replaced. At the very least it will need to be repaired, but before you invest in a replacement make sure you are indeed the owner of the fence. 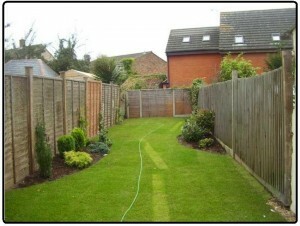 On many modern housing estates gardens can be bordered by four other properties with a fence in common. There are many theories floating around about the fence on the right side of the property being the homeowner’s responsibility, or if the good side faces your house. While these may well be true in many cases there is no hard and fast rule about garden boundary ownership. Instead the only place to find an answer that is 100 per cent accurate is in the deeds of your house, which should flag up the boundary that falls under your ownership. If the deeds are hard to find your best bet is to ask the neighbours which side of the property their fence is on – if you ask a few the pattern should emerge. Obviously if you are on good terms with your neighbours everything is a lot easier in relation to garden renovation. Should your neighbour refuse to repair a fence you have every right to put up an additional fence running alongside it on your property. There is a lot to be said for good neighbours, particularly when it comes to fence maintenance! For more information on fencing contact Garden Busters. Posted December 20, 2017 by admin & filed under Latest News. It’s that time of year when trees come indoors – yes, Christmas is here and thousands of homes will be furnished with beautiful conifers. Christmas trees are part and parcel of our festive celebrations and many families are happy to pay anything between £20 and £60 each year for a decent tree. While the cost may put some people off the idea of investing in a tree every Christmas, there is also the idea of waste. Come the first week in January and there will instead be thousands of sad-looking trees heading for the recycling. But there is another option – and that is grow your own. A trend does appear to developing for people decorating trees that remain in their garden – and it’s not just Christmas trees. While lights have been added to beautiful external trees for years, baubles are starting to make an appearance in the garden too. More notable, Christmas trees are finding a place in family gardens. While for most of the year they stand unnoticed as a conifer, come Christmas these look fantastic with lights added. Environmentally-aware consumers have also chosen to invest in potted Christmas trees, which while more expensive at the outset obviously cost less in the long-run. Most living Christmas trees come in a pot for ease of transport and storage. If you choose to opt for a potted version it is advisable to re-pot the tree every year to allow it to grow. Conifers as a general rule are easy trees to maintain. 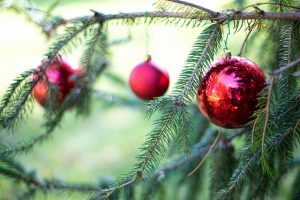 The only considerations with a potted Christmas tree will be to maintain the shape with regular trimming and keep an eye on the growth of larger branches while removing any that die. Alternatively, the tree could be planted into the garden from the pot. To plant a Christmas tree directly into your garden you will need to ensure it has the root ball still attached. Like potted Christmas trees, once in the ground the tree will be easy to look after and require little maintenance aside of trimming. Beware though, Christmas trees can grow quickly and substantially – reaching up to 50 feet. Living trees also need to spend less time inside to avoid being damaged – around 10 days is the average time recommended. When thinking about your Christmas tree this year, turn your thoughts to the garden and consider whether it would welcome a festive addition. For any information on tree maintenance contact Garden Busters. Posted November 16, 2017 by admin & filed under Latest News. Houses, warehouses, roads – there is a lot of competition for space in our communities but spare a thought for the humble tree. Development, unfortunately, often comes at a price for nature. And this is the time that Tree Preservation Orders frequently come into play to protect trees of special interest. What does a Tree Preservation Order mean? A Tree Preservation Order is made by a council to protect a tree or woodland from harm or destruction following an application, which anyone is free to make. If a Tree Preservation Order exists for a tree on your property you need to abide by it or face prosecution. In light of the restrictions put in place by a Tree Preservation Order it is often necessary to apply to the borough council to carry out work to any tree that is subject to an order. Despite the restrictions in place it is the duty of the homeowner to ensure that the tree is properly maintained. Carrying out work to a tree under a Tree Preservation Order can involve putting a form together detailing what work is required and why it is needed. Councils do have the right to refuse the work. When an application for work on a protected tree is approved the council will reply with a written response. Delicacy and thoroughness are essential to make sure that work is properly carried out when a Tree Preservation Order is in place. Rather than take on the complicated task yourself it is wise to seek the help of a tree surgeon, who can advise on the work needed and how to go about it. If you have any concerns about a tree on your property contact Garden Busters for expert advice. Posted October 17, 2017 by admin & filed under Garden Maintenance. Autumn is a great time for gardeners to lay the foundations for springtime success. A little bit of effort before the first frost goes a long way to protecting your garden and keeping it in tip top condition. Really it could be seen as a spring clean for your garden, it’s just the opposite season! For many people lucky enough to have the space, a lawn is the centrepiece of the garden. While you will be happy to say goodbye to the summertime routine of mowing, there are a few tasks to be done that will help to leave your lawn in good condition. Try to squeeze in a final mow before the end of October to tidy up the grass before it gets too wet, but leave a bit of length. 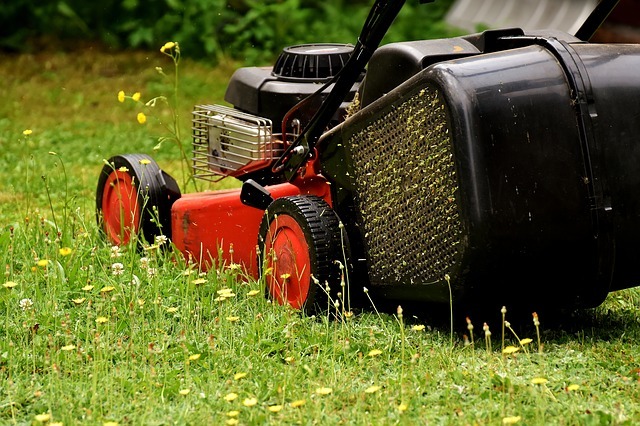 Clearing the lawn of debris, such as leaves, is also an important task as this will help to ensure light can reach the lawn, and it will help to avoid patches of dead grass and moss. Specialist autumn fertilizers can also be sprinkled on the grass to help nourish and protect lawns over the colder months as growth stays low. Autumn is also the time for a reshuffle should you being unhappy with the locations of any plants. While the ground is still warm enough, carefully dig them up and move them to their ideal spot. Complement any changes with cutting back dead branches and foliage to prevent decay and make sure everything is in tip-top condition before hanging up your secateurs for the winter. Delicate plants will also need extra protection through winter so carefully lift these without damaging the roots and store in dry sand over the winter. Add a good layer of compost, leaf mulch or bark to borders to help protect plants through the cold weather. Many spring-flowering species need to be planted by the end of autumn, so plan ahead for what you want to be looking at in the spring. Daffodils and hyacinths need to go in as soon as possible, while favourites such as alliums, lilies and tulips also need planting in autumn. If you are concerned about the state of your lawn – or need an extra hand to stay on top of maintenance – get in touch with Gardenbusters today. Barking up the wrong tree? What species are best suited to gardens? Posted September 12, 2017 by admin & filed under Latest News. Trees are a fantastic addition to gardens – they bring privacy, interest and wildlife, but not all species are ideal for smaller gardens. 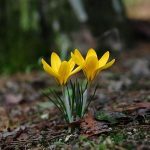 Such is the powerful nature of trees that planting the right species can even help to control garden problems, particularly if you have clay soil or drainage issues. Some trees, however, need space to breathe and, more importantly, grow – sometimes to epic proportions. With this in mind it always makes sense to do your research before investing, and to check out what is in your garden should you move house. Japanese Maples (Acers) – These trees are available in lots of smaller sizes. Beautiful to look at, they boast fantastic autumn colours. Crab Apple – These trees have it all – fruit, beautiful spring blossom and can help with clay soil. Amelanchier – These also help with clay soil and have displays of blossom in spring, as well as colour in autumn. Cherry Blossom – A real favourite in many households for their impressive blossom, these make a great centrepiece. Although make sure to plant in an area where there is room for their roots. Eucalyptus – Hardy and easy to care for, Eucalyptus make a good choice – but stick to the smaller variety. Leyland cypress – These grow at an impressive rate and are incredibly thirsty. Although they make a great boundary they can leave patches of dead grass and block light from your garden. Poplar – These are also fast-growing, thirsty plants that put down strong roots. Planted near to a building they can cause subsidence issues. Oak – We all know what size these can grow to, but aside from that their shallow roots can grow rapidly becoming a problem for nearby buildings. Ash – Beloved by many as a native, healing tree, be very careful that you have enough space to accommodate these fast-growing trees – and enough time to maintain them. Obviously if you are lucky enough to have a huge garden that resembles a field in size, go for it and enjoy having the freedom to choose. If, on the other hand, space is at a premium and you have a tree that is causing problems for you or your neighbours contact Garden Busters for advice. Have you been left stumped by how to get over the final hurdle to clearing a patch of your garden? 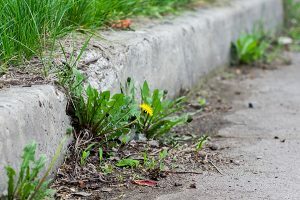 Maybe you’ve moved into a new house and want to make a few changes, or you could have decided it’s time to tackle a long-ignored part of the garden. 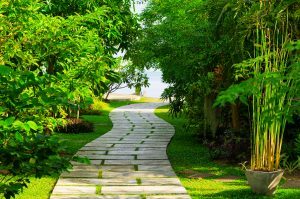 However, grand plans to overhaul parts of the garden or put in a new path can often hit a bump when it comes to the problem of dealing with tree stumps. Gardeners can be left surprised by the size of tree stumps left behind when attempting to remove shrubs, trees and bushes. It doesn’t matter how deep you dig, your efforts are quite likely only to be rewarded with a snapped garden spade and backache. Getting to the root of the problem, tree stumps are quite often just too tough to prise out by strength and determination alone, and are too deep to be tackled with a saw or axe – instead these times call for expert help. While naysayers may tell you there is nothing that can be done to get rid of large tree stumps, Garden Busters can help you to prove them wrong. Specialist machinery that is surprisingly easy to move around will work beneath ground level to grind up stumps allowing you to make use of the area. Equipped with a sharp blade, stump grinders cut through troublesome tree stumps turning them into sawdust that can then be removed from the garden. This leaves a hole that can be used to plant an alternative – or clears the way to lay a pathway or patio. Don’t listen to anyone who says there is no solution for dealing with deep-rooted stumps, contact Garden Busters to find out how we can help you to realise your garden ambitions.